Francisco Chacón Jiménez (1948, Pliego, Murcia). I was graduated (1971) and PhD (1977) in Modern History from the University of Murcia which I sit, hired as a teacher, during 1971-72, becoming associate professor of Modern History in 1983 and reaching the university chair, Modern History in 1993. After my early urban history (1979, Murcia in the century of the Five Hundred), social organization, especially the family and social history, along with local history (he directed, 1980 History of the Region of Murcia, 10 vols. ; 1990, Lorca Past and Present. Contributions to the History of the Region of Murcia, 2 vols., 1995-2005, History of Cieza, 5 vols., 2008, History of the Palaces, 2 vols.) are my objects of research historiographical concerns and priorities. A) Creator (1982) and director, with Professor Franco Hernández, Seminar Power Elite Family and currently in force and has since 2007 with a collection of books: Family, Power Elite, Social History (ed. F. Chacón Jiménez -J. Hernández Franco). 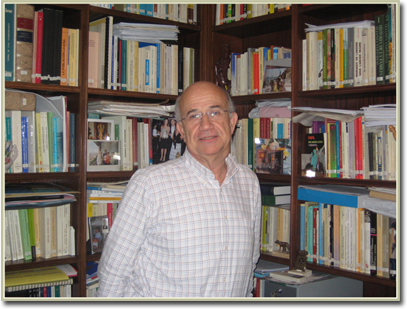 B) founding member (1995), along with the lawyer and professor Antonio Montoro Fraguas Foundation Center for Historical Studies and Research Local Murcia, of which I am, currently, director and presiding the Hon. D. Antonio Perez Crespo, lawyer, president of the Autonomous Community of Murcia and official chronicler of the Region of Murcia, the Local Studies Chair John Torres Fontes, is an important benchmark for our activities. C) I have participated in the boards of associations: Historical Demography (1995-1999), Social History (1997-2002, as Vice President, 2002-2006) and Spanish Foundation of Modern History (1987, 2003-2006 and Vice President as Chairman 2007-2010). My questions and concerns are for the recovery and understanding of the past as the main leitmotiv of everyday life. In this context include the inspiration and participation in the project: Water Street, the City Council Pliego performed in this locality. The sense of personal commitment to society in general is an ideal that inspires my participation in the activities described.